A Monthly Journal Devoted to Oriental Philosophy, Art, Literature and Occultism: Embracing Mesmerism, Spiritualism, and other Secret Sciences. 1879 Monthly Bombay, and then Adyar, India. Publisher: Theosophical Society. Editor: H.P. Blavatsky, H.S. Olcott, et al. Corporate author: Under the auspices of the Theosophical Society. 1/1, October 1879-current. 32 pp., 10 x 15. Rupees 8 a year in India, and 10 in Europe and the United States. 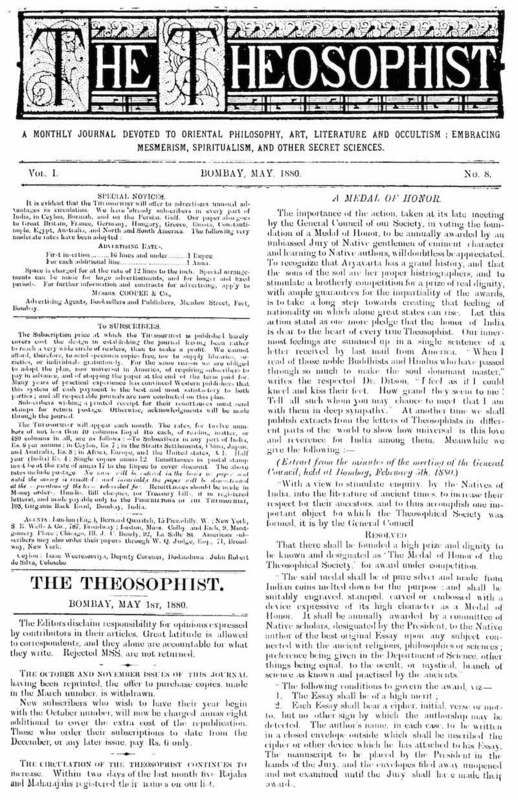 This is a (indeed, the) Theosophical journal, but its aims as set out in its first subtitle were much broader and its pages included so much of interest to spiritualism and occultism generally that it must be included here. Initially edited by, and largely written by, H.P. Blavatsky. Facsimile copies of the first six volumes have been published by the Edmonton Theosophical Society; Harvard University; Eastern Illinois University; McMaster University, and other locations in OCLC.